Devoid Of Culture And Indifferent To The Arts: Gardening: Weirdest tree in Nova Scotia? Last year, when we started a new garden divider, we went looking for unusual accent specimens. Boy, did we find one. 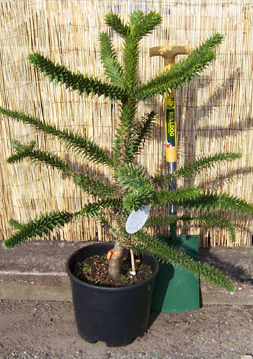 We purchased a Monkey Puzzle tree from Crosby’s Garden Centre in Sandy Cove, NS (abutting Liverpool). Crosby’s has quite a few "out of the ordinary" plants. Many of them you won’t find locally anywhere else that I know. We purchased ours at almost the identical size in the image at left. This tree (also called the Chilean Pine) is the national tree of Chile and is rated, believe it or not, to USDA Hardiness Zone 7 (or Zone 6b with protection) and can tolerate -20°C. Our garden—Zone 6-ish—is in a bit of a micro-climate, being moderated by its proximity to water, and we've had success with other plants that we really shouldn't have been able to grow. The leaves are triangular “scales” that are closely set, and when mature bears cones not unlike our native pine. 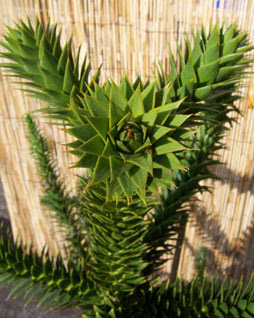 The entire plant looks quite reptilian, and according to Wikipedia the cone seeds are edible. Why the strange common name? Direct from Wikipedia: “The proud owner of a young specimen at Pencarrow garden near Bodmin in Cornwall was showing it to a group of friends, and one made the remark ‘It would puzzle a monkey to climb that’; as the species had no existing popular name, first 'monkey-puzzler', then 'monkey-puzzle' stuck.” (link) I imagine it would puzzle anything that wanted to climb it. It’s not the nicest thing to touch. The “leaves” are very hard and pointy. Currently our specimen is shrouded in small Norway Pine trees, stuck around the base and up in through the branches. It’s our attempt to keep it sheltered from the worst of the winter weather. We’ll see if our actions were in vain or not come spring. Crosby’s has one that is nearing 3 metres, and they protect theirs in a similar way. I don’t know what we’ll do for winter protection in years to come when ours gets larger. Time will tell if we even need to worry. In the meantime, it’s certainly an interesting plant to have.